A couple quick notes — If anyone is still using the old [email protected] email address to contact me, that account has now been closed; please use the address you’ll find on the About page. And use extra caution if you’re riding in the rain today, or any day this week. Most drivers can’t imagine anyone would ride in wet weather, and aren’t likely to be looking for you. At all. The FBI could be preparing to take down one of bicycling’s biggest supporters on the city council. The Los Angeles Times is reporting that DTLA Councilmember Jose Huizar is a subject of a wide-ranging investigation into possible “bribery, kickbacks, extortion, and money laundering involving 13 people” in the Los Angeles city government. Also among those 13 is South LA Councilmember Curren Price, and a senior aide to Council President Herb Wesson. 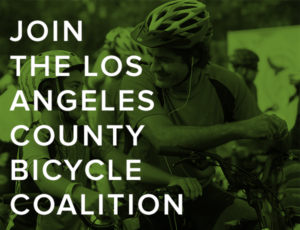 Huizar has overseen the rapid expansion of bicycling networks in DTLA, while Price was responsible for killing plans for a desperately needed bike lane on historic Central Ave and removing it from the city’s mobility plan. But supporter or not, there’s no excuse, ever, for corruption. If any or all of those under investigation are indicted, let alone convicted, they should leave the council immediately — and have a nice, long sentence to reconsider their crimes. It just hurts a little more when it’s a trusted ally like Huizar who’s done so much good for the community. Very sad news from bike-friendly Davis, where an apparently disturbed gunman rode his bicycle up behind a young cop as she was investigating a traffic collision, and shot her multiple times, before reloading and shooting wildly around him. He then rode his bike back home, locked himself in his apartment, and fatally shot himself as police tried to get in. He left behind a letter claiming the police had been assaulting him for years with “ultrasonic waves” meant to keep dogs from barking. After a Fresno woman was sideswiped as she was taking the lane in Clovis, the road raging driver lunged his car at her when she complained, then got out and physically attacked her. Although here’s a hint: If you don’t want the occupants of a car to assault you, don’t use pepper spray on them — regardless of how much they may deserve it. The next generation of e-scooters is about the hit the streets of Austin TX, courtesy of an Oxnard company. The scooters are designed for street use, with seats and wider platforms and tires for greater stability. Maybe that will help reduce the e-scooter conflicts on the sidewalks. Meanwhile, Los Angeles County is attempting to shove the genie back into the bottle, as it considers a policy that would ask companies to pretty please not to deploy their scooters in unincorporated areas. The Wall Street Journal has prepared a 20 minute video about Denise Mueller-Korenek’s successful attempt to set a new bicycle speed record of 184 mph. Thanks to George Wolfberg for the tip. Not only is this guy better on a bike than you — or me, for that matter — he’s only eight years old. Seriously, when I was eight years old, I was still trying to master a controlled skid on the gravel playground across the street. Los Angeles is proposing a nearly one-mile bike lane on deadly Winnetka Ave, connecting the Orange Line to the LA River bike path. 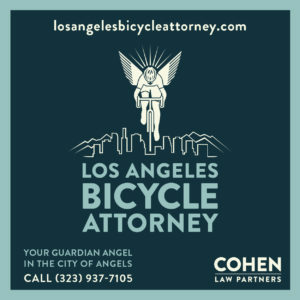 Streetsblog offers a short interview with new LACBC Executive Director Eli Kaufman. KABC-7 profiles Manny Silva, the Mexican-born owner of Compton’s Manny’s Bike Shop, builder of some of the world’s best chromed-out, custom low-rider bicycles. If you prefer to do your riding inside, especially in this weather, Peloton has opened a new Pasadena showroom. A new 185-acre, 450-home residential development in Santa Clarita will include an 11-acre park with 10 miles of shared-use pathways. Santa Monica is finally taking steps to improve safety on deadly Wilshire Blvd as part of the city’s Vision Zero program; unfortunately, no lane reductions or bike lanes are planned. A UC Irvine student was seriously injured when his bike was struck by a rideshare driver leaving a parking structure Friday morning. A group of bighearted Laguna Beach middle school students built bicycles for children at the Orange County Rescue Mission as part of their annual Christmas toy drive. Spectrum News 1 considers Riverside’s Bikes for Vets program, where veterans refurbish confiscated bicycles for people in need. The Coachella Valley bicycling community turned out on Sunday to remember fallen bike rider Will Campbell, who was killed by a speeding driver exactly one month earlier. Thanks to Victor Bale for the link. A couple takes an ebike ride along the Monterey Peninsula’s famed 17 Mile Drive. And discovers bike riders don’t have to pay the $10.25 toll. A bike riding Bay Area architect switched to rowing after surgery for a brain tumor left him blind; he says he’s now even better at his job. 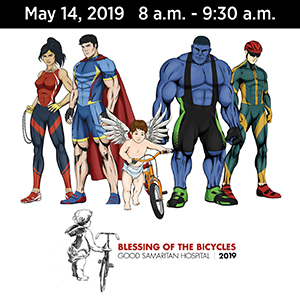 There’s a special place in hell for whoever broke into a Stockton ministry that built and refurbished bicycles to donate to people in need, forcing it to close after it was broken into for the fourth time. Americans are now more likely to die of an opioid overdose than in a traffic collision. Which is not actually good news. The Bike League offers five tips on how to build a more bike friendly business. Your next helmet could take you from bicycling to snowboarding, complete with built-in speakers and microphone, impact sensor and turn signals. Which would no doubt come real handy on the slopes. Especially the turn signals. Writer and artist Anna Brones is one of us. A former addict is riding his recumbent through 48 states to raise awareness of addiction. Bicycling says the death of bike commuting has been greatly exaggerated, noting that commuting rates are still way up from just ten years ago. Meanwhile, the magazine looks at the best bike tech from the CES trade show in Las Vegas. New Mexico state legislator Angelica Rubio finished her six day, 350-mile bike ride from Las Cruces to Santa Fe for the new legislative session. Nice story from a small — okay, minuscule — Kentucky town, where a tree-cutting crew pitched in to buy a new bike for a man who came to watch them work every day, after his was stolen. Liev Schreiber is one of us, as he goes for a cold weather ride in NYC. My new hero. Bike-riding New York Rangers hockey player Sean Avery is picking fights with people who park in bike lanes. He gets it. A New Jersey letter writer says streets aren’t just for car owners. Road.cc ranks their top ten commuter bikes for under $1,300. Note to Road.cc — if you’re doing a piece on commuter bikes, try not to picture most of the people riding in spandex. Vancouver bicyclists aren’t thrilled bikes have to share a lane with buses. And neither are the bus drivers. He gets it. A Toronto columnist says the city’s bike lanes prove transportation solutions can be cheap and effective. No surprise here, as London’s attempts to reclaim the streets to fight pollution have been met with hate and anger from some drivers. Brit bike hero Chris Boardman says he knows how to turn auto-centric Manchester, England into a bicycling city, setting an example for other cities to follow. The Guardian says British bike shops are closing because Millennials think bicycling is too scary. Seriously, is there anything Millennials don’t get blamed for these days? Interesting idea. A German company has developed a city bike that converts to a cargo bike and back in just seconds. It’s set to sell for around $2,000 when it hits the ground this summer. Luxembourg is now the first country to make all transit free. The Guardian asks why is Australia failing its bicyclists. Which is a question we should be asking here, too. 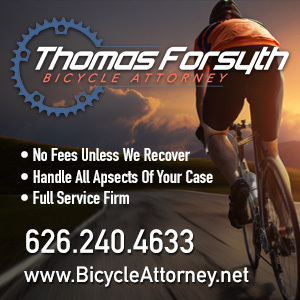 Japan is moving forward with plans for mandatory liability insurance for bicyclists. Caught on video: A Singapore bicyclist is lucky to escape with a few scrapes after falling trying to move away from a bus during a far too close pass. The South China Morning Post asks who gets the blame credit for fashion’s current bike shorts craze. Australia’s Caleb Ewan held off Peter Sagan to win his home country’s Tour Down Under, beating last year’s champ by a bike length. Wired examines the insane numbers behind the hour record, calling it bicycling’s most masochistic race. Bicycling profiles 2016 Trans Am champ Lael Wilcox, calling her the fastest untraendurance racer in the world. And questioning why anyone else even bothers. Forget racing in the SoCal sun. If you really want to impress everyone, try racing on snow and ice in the dead of the Alaskan winter, with a wind chill of -11° Fahrenheit. And leave those skinny tires at home while you’re at it. No, ebikes don’t pedal themselves. If Strava crashes, did your ride really happen? And if motorcycles don’t need riders anymore, how long before your bicycle can do a century while you sleep on the couch? Thanks to John H for his generous donation to support this site. Donations of any size are always welcome.